A: Delta is realigning Domestic premium cabin booking classes as part of its ongoing effort to more consistently and transparently display fare choices, while better aligning with our joint venture partners. A: Delta is taking a phased approach for this realignment. On October 20, 2018, Delta performed a schedule change for the SEA markets to move domestic First Class booking classes from FPAGR to JCDIZO for travel on or after November 1, 2018. Effective November 3, 2018, Delta will expand this to include almost all Domestic First Class markets for travel on or after April 2, 2019. 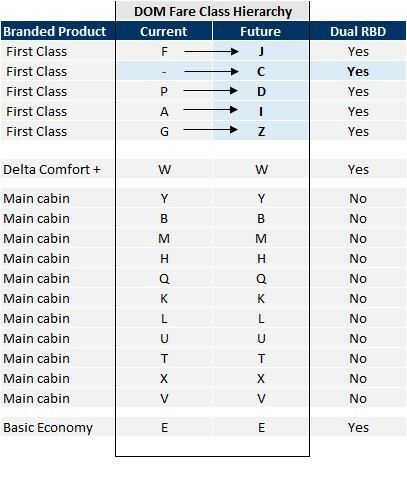 Q: What booking classes will be used in markets that have both Delta One and Domestic First Class? A: Markets that operate both Delta One and Domestic First Class will continue to use FPAGR for Domestic First Class until further notice (affected markets include JFKSEA, JFKSAN, JFKLAS, BOSLAX). Q: What happens to bookings made for travel November 3, 2018 through April 1, 2019? A: Domestic First Class bookings made to/from/through SEA will continue to book in JCDIZO, reflecting the change implemented on October 20. The remaining domestic markets will book into FPAGR for travel before April 2, 2019. Q: What happens to bookings that were made before November 3 schedule change? A: PNRs created before the November 3 schedule change in the impacted markets will be rebooked into J, C, D, I, Z or O Class, and no action is required. Q: What happens to SEA bookings that experienced the previous schedule change on October 20? A: The November 3, 2018, schedule change will not impact the previous SEA market implementation that took place on October 20, 2018. Exception: JFKSEA route will be updated to FPAGR to account for the market being served by both Delta One and Domestic First Class as mentioned in a previous question. Q: If I have an EMD associated to a GDS issued ticket, do I need to contact Delta to have this reassociated to the PNR? A: Korean Air has a fare class mapping limitation that does not allow for different mappings by date range. October 20, DL zeroed out KE* mapping into the Domestic F cabin on DL in SEA market for flights on or after November 1st to avoid denied sales. Bookings made under DL* or interline bookings were not impacted. DL will now expand and zero out KE* mapping for all Domestic F cabin on or after April 2, 2019. Sales will resume for First Class on KE* when Domestic First booking class alignment is complete in all markets. Other partners do not have the same limitation and should see no impact. Q: How will my accounts be impacted by this? A: Accounts with a front-end PoS program (e.g., AC787, AC404, etc.) will not see a change in their eligible commission, as rates are consistent across First and Business Classes for the impacted markets. Sales Development has updated all program documents and uploaded new versions to each account’s agreement section in Salesforce. Q: What does this mean for GAIN earnings? A: Sales Development analyzed the impact to GAIN earnings for all of our accounts and for the vast majority, there is no impact as pay rates / commissions are consistent between Domestic First Class and Business Class. For accounts that are materially impacted, your Sales Development analyst will reach out to discuss next steps.